Williams was born in the Bahamas and raised in California. He partnered with another black performer, George W. Walker, in 1895 to create an enormously successful comedy team. 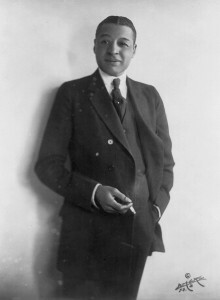 Williams’s greatest success was in the Ziegfeld Follies, where he played a dim-witted black stereotype character in blackface make-up— because his own complexion was not sufficiently dark for the stereotype. Williams’s performances— especially his dryly fatalistic signature song, “Nobody”—were always charged with a poignancy that reflected the racial bigotry in which he worked.